The Beesley name has been associated with fine stonework since 1889. 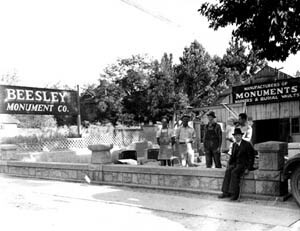 Richard and Nathan Beesley, fourth and fifth generation monument craftsmen currently operate the Beesley Monument Company which has been located in Provo for 122 years. Thomas took up farming but eventually purchased a monument shop (Provo Marble Works) from Mr. A.O. Fuller. Thomas’ son, Thomas Albert Beesley had worked as an apprentice stone cutter in Fuller’s shop. 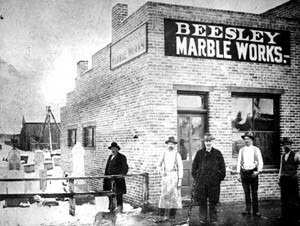 The name soon changed to Beesley Marble Works and was run by Thomas Albert and his brother, Richard. Thomas Albert and his wife, Sara Liddiard, had eight living children, six sons and 2 daughters. 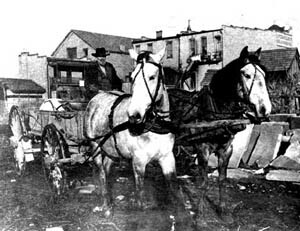 Their sons learned the monument trade, but during the depression all but one were forced to leave the Provo area in search of work. Only their youngest son, David, remained at home to help run the business. In those days, almost all the work was done by hand. The monument business was always demanding. Their most valuable assets were a good team of mules, strong muscles, and a lot of patience. They quarried their stone on the backside of Mount Timpanogos, near Midway, Utah 25 miles away. After the summers’ work they hauled the stone back to their shop in Provo and cut, crafted, and shaped it during the cold, snowy winters. In 1939, Thomas Albert Beesley turned the entire business over to his son, David, who eventually changed the business name to Beesley Monument Company. Then, in 1952 he moved the shop to its present location, conveniently located just across the street from the Provo Cemetery at 725 South State Street. David and his wife Geaniel, had four children, two sons and two daughters. 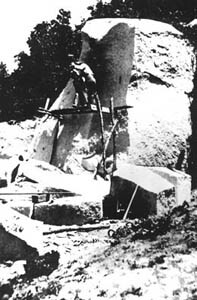 The sons, Wayne and Richard, were fourth generation monument builders, and learned their stone cutting, carving, and engraving skills very early in life. After completing their education at Brigham Young University they took over management of the company in 1972. In current day 2011, Wayne has retired and Nathan, Richard’s son, has assumed the next generation’s role in the ongoing legacy that is the family management of Beesley Monument Company. They run one of the largest full-service monument and memorial businesses in the Intermountain West, and have shipped their special hand-carved creations all over the world. True artisans, Richard, Nathan, and the rest of the family represent the best of the talents of five generations of Beesleys. Added to their rich and gifted family and business history is their sincere desire to pass on their combined knowledge, expertise, and pure artistry in the form of one-of-a-kind monuments, meticulously designed to best remember and honor their customers’ loved ones.